Our portal technology is built on industry standard HTML5. Although compatible with the iOS or Android operating systems, iOS has limited support to a single mp4 video stream. So to keep a similar look and feel across phone and tablet platforms, you must install the ONLINE and OFFLINE applications found in either the Apple App Store or the Google Play Store. ONLINE and OFFLINE Application minimum requirements: iPad 3 and above with 1GB of memory or higher. Note: Video playback will be inconsistent on iPad 1 and iPad 2 due to device memory limitations. Access over 3G/4G cellular connectivity is NOT recommended nor supported. iOS Apps are available for download from the Apple App Store. The internet based "ONLINE" applications allow you to view your entire library of videos using a Wi-Fi internet connection. The "OFFLINE" hardset based applications allow you to download videos to your iPad and/or iPhone and access locally without the need for an internet connection. To refresh your video list: tap/hold the screen and swipe down. To close a video and return to the video catalog listings: tap “< Back” in the upper left corner to close the video. To logout of the mobile application: tap “Logout” in upper right corner. ONLINE and OFFLINE Application minimum requirements: Android based tablet with 1GB of memory or higher. Access over 3G/4G cellular connectivity is neither recommended nor supported. The "OFFLINE" hardset based applications allow you to download videos to your Android tablet and/or phone and access locally without the need for a Wi-Fi connection. Android Apps are available to download from the Google Play Store. To refresh your video list: tap the refresh icon at the top right. To close a video and return to the video catalog listings: tap the 'back' button. To logout of the mobile application: if you are in a video and wish to logout, tap the menu button and then tap logout. Note: You may encounter intermittent slow response in opening Documents (PDFs) as well as certain pictures/illustrations rendering incorrectly or not at all. This is due to current limitations of the built-in Android library used to view PDFs. Tap the magnifying glass to enter video search criteria. Tap the three vertical dots in the upper right corner displays the “Refresh”, “Settings” and “Logout” options. Tap “Refresh” to refresh your video list entries. If any new videos have been authorized they will now appear in your list. Tap “Settings” to control your video timeout option. By default, the video will pause after 10 minutes of no user device interaction. Tap “Logout” to log out of the application. This will return you to the Username and Password Screen. The “Forgot Password?” link will open a web browser link to the “Forgot Password” options on the web login screen. Simply enter your user name and select Forgot Password. An email will be sent to the email address configured for your userid. Note: Upon user login, if you tap a video to watch and you do not have a WiFi connection, you will receive a message stating, “A WiFi connection is recommended to view videos. Should you proceed, your cellular data plan and video performance will be impacted”. You can choose cancel to return to your video catalog listing or continue to proceed watching the video. The player window displays the Video tab containing the main camera angle (1) and supporting angle 2 numbered for your convenience, and the Documents and Related Videos tabs. The video play bar appears over angle 2 in transparent mode and will auto disappear after 5 seconds. To redisplay the video play bar, simply tap the screen. Tap “<” in the upper left corner to close the video and return to the video catalog listing. Tap the three vertical dots in the upper right corner displays the settings and logout options. Tap “Settings” in the upper right corner to control your video timeout option. By default, the video will pause after 10 minutes of no user device interaction. Tap “Logout” in upper right corner to log out of the mobile application. Tapping either the Documents or Related Videos tab will pause the video at the current location. Tap a Document entry to view the document. You can swipe right to left to review the entire document spanning multiple pages. When complete, tap “Close” to return to the Document tab. Tap a Related video entry to watch the related video. The video play bar will auto appear and then disappear after a few seconds. Simply tap the video to redisplay the video play bar. When complete, tap “Close” to return to the Related Videos tab. Tap the Video tab will take you back to the video and begin playing the video from the paused location. Note: If you paused the video prior to selecting a document or related video, you will have to manually start the video. In landscape mode, the player window displays the Video tab containing the main camera angle (1) and supporting angle 2 numbered for your convenience, and the Documents and Related Videos tabs. You will see two icons in the lower right corner. The left icon controls the split screen functionality. The right icon enables you to select addition angles. Pressing the right angle selection button, moves angles 1 and 2 to the left and displays angles 3 and 4 vertically. Tap, hold and move the angle to either the main angle 1 or the supporting angle 2. When done with angle selection, tap the angle selection icon to move back to 2-angle display mode. You can now tap the split screen icon to enable the split screen functionality. Note: When swapping angles on Android you will see an intermittent loading message while the operating system adjusts and resyncs the video feeds. 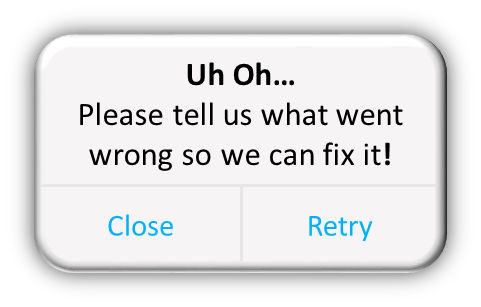 A screenshot of the error or bug/issue you're experiencing. An explaination of what happened, or the sequence of events/clicks that preceeded the error. The device being used when the error was encountered (please be as specific as possbile; e.g. iPad 2/ iPad 3 w/Retinal Display/Samsung Galaxy Tab 4 7.0/Samsung Galaxy Note 10.1 2014 Edition, etc.). Apple: Settings/General/Usage/Manage Storage NOTE: Select 'Manage Storage' under STORAGE heading, not the ICLOUD heading, then Select the appropriate Application to obtain version info. Android: Settings/General/Application Manager - Select the appropriate Application.